The Deep State has gone into panic mode after President Trump announced an immediate withdrawal of US troops from Syria. Trump broke the unexpected news on Wednesday, prompting a furious backlash from Democrats, neoconservatives and so-called “progressive” journalists. 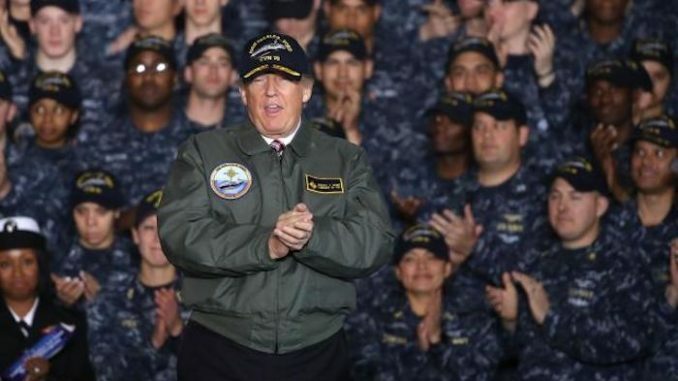 Antiwar.com reports: Trump presented the move as a natural response to he defeat of ISIS, which is leading a lot of hawks to deny that ISIS is really defeated. Sen. Lindsey Graham (R-SC) compared this to the 2011 withdrawal from Iraq, and said Congress must make Trump explain the policy. Still, since the war has been spun as being sort of about Iran, analysts are still predicting anger among Iran hawks, both in the cabinet and in the party leadership. Charles Lister from the Middle East Institute said it might plant the seeds for rebellion among Republicans to not be in the war. Hillary Clinton advisers said the move would “strengthen Russia,” and CNN’s Jake Tapper quoted an unnamed Pentagon official calling the end of the war a Russian victory. Yet Russia has also been very public in drawing down its own war effort. Indeed CNN was broadly critical in its coverage of the move out of Syria, generally focusing on liberal opposition to the change. The opposition appeared primarily built around it being a Trump policy. MSNBC was also critical in its coverage, quoting former CIA Director John Brennan and multiple analysts reiterating the narrative that underpins the long-term presence in Syria which the rest of the administration had been parroting up until today. The Pentagon had been positioning the US for a permanent presence in Syria, coming up with additional military goals beyond the defeat of ISIS, centering on demanding all Shi’ite militias leave Syria, and ensuring ISIS-like groups never reemerge at any point in the future. While unachievable goals make for a permanent war, it would be difficult to justify this with the Syrian government not authorizing the US presence, and the US no longer demanding regime change. Yet there doesn’t appear to have ever been a public deadline. Trump, rather, has long expressed interest in ending the war, and it’s only been intense pressure that’s kept him from doing so before now. Whether it’s Iran or Russia that’s the excuse, a number of senators seem to be lining up to issue brief statements opposing the end of the war. It seems after so many years of war, many believe this will be the safer position to take.